Silverfish are small, wingless insects. Its common name derives from the animal's silvery light grey and blue color, combined with the fish-like appearance of its movements, while the scientific name indicates the silverfish's diet of carbohydrates such as sugar or starches. Silverfish are nocturnal, elongated and flattened insects typically 13–25 millimetres (0.51–0.98 in) long. The newly hatched are whitish, but develop a grayish hue and metallic shine as they get older. Silverfish typically live for two to eight years. Silverfish consume matter that contains polysaccharides, such as starches and dextrin in adhesives. 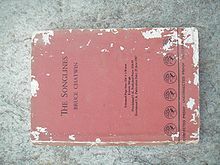 These include glue, book bindings, plaster, some paints, paper, photos, sugar, coffee, hair, carpet, clothing and dandruff. Silverfish can also cause damage to tapestries. Other substances that may be eaten include cotton, linen, silk, synthetic fibres and dead insects. During famine, a silverfish may even attack leatherware and synthetic fabrics. Silverfish can live for a year or more without eating. 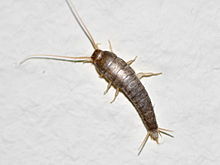 Silverfish are considered a household pest, due to their consumption and destruction of property. Although they are responsible for the contamination of food and other types of damage, they do not transmit disease. Earwigs, house centipedes and spiders are known to be predators of silverfish.